(Oregon Coast) – It's time to expect the unexpected; to follow the beach path less traveled. It's time to discover something new and utterly remarkable along the Oregon coast, in the form of places with surreal grandeur and wild, dramatic beauty that is completely new to the eyes. Here, you'll find four spots you won't believe exist along the Oregon coast, each with its own striking spectacle and unique aspects you may not even have imagined. Places where the ocean shoots into the sky, where freaky features appear out of nowhere, or maybe even where you find yourself just a few feet lower than the ocean – without getting wet. Click on the links for the virtual tours of these areas that host even more photos. Oceanic Canyon at Kiwanda. You can see glimpses of this from above as you wander the top of the much-revered Cape Kiwanda, but nothing – seriously, nothing – prepares you for the grand spectacle from the right angle. At the northern tip of Kiwanda there is what can only be described as a stunning ocean canyon lurking just beyond view from any other vantage point, a labyrinth-like collection of soaring cliffs and towering island-like structures where the ocean careens from rock wall to rock wall like a massive, watery pinball machine..
All this sits on the northern face of the cape, reachable by either of two ways. One is the secret beach entrance about a mile north of Pacific City, off an unmarked, tiny road. Then you have to walk a mile back to the cape, although you can actually drive on this beach. That's not advised, however, as you'll likely get stuck. The other means is walking over the dune from the top of Kiwanda to its north face. There, a massive pile of boulders from an arch that fell years ago has literally held back the tide in an unusual way. You can – or at least could, until recently – walk up to this vantage point, and you'll be stunned to notice the ocean is just a bit above you. A caveat: viewing this spot in this way may soon not be possible, as the boulders that allowed you to peek into this area are disappearing. However, using a zoom lens you should be able to see much of the canyon if you stand on an outgoing curve in the beach a ways away. Cook's Chasm, near Yachats. 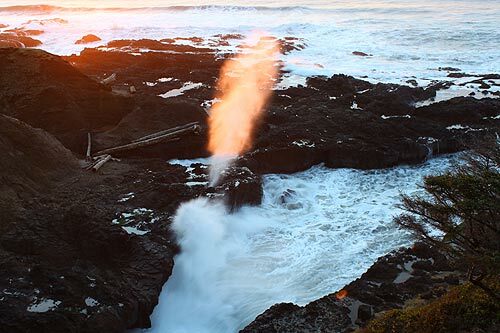 There are a handful of spouting horns along the Oregon coast, but this one is a freakish, fiery stunner. In this case, the spouting horn at Cook's Chasm is a watery geyser that gushes out at a slightly odd diagonal, and sometimes extraordinarily high. When it does so, it makes a trippy noise – a combination of a woosh and a massive hiss – not unlike a whale spouting. Visually, it looks an awful lot like the black smoke monster from the show LOST, albeit a white version. It's also worth it to wait until the end of day to hit this amazing spot just south of Yachats. At sunset, the rays catch it just right and light it up, giving it a flame-like appearance. 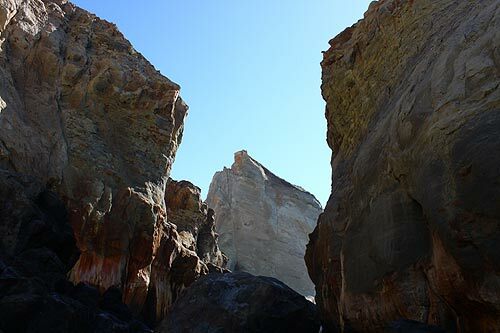 These blowholes in the rocks are created when the structure allows sea water beneath it, and there is a hole or extended crevice where all that water pressure is released. 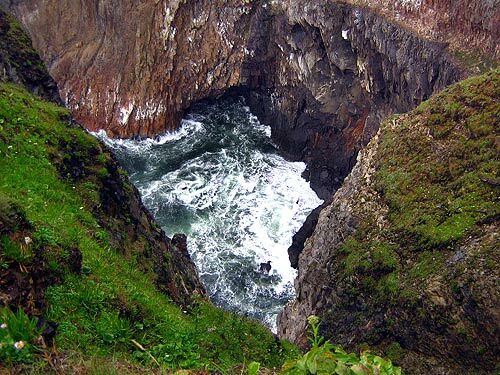 Other funky sights lurk here as well, such as Thor's Well – a hole in the rocks where the ocean seems to disappear. Tube-like Cove Near Manzanita. Picture a cove about three hundred feet below you, one that you can only see through a giant hole in the cliffs above it. 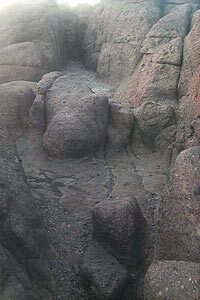 This is the wild and weird Treasure Cove near Manzanita, which can only be viewed from a strange structure up top. 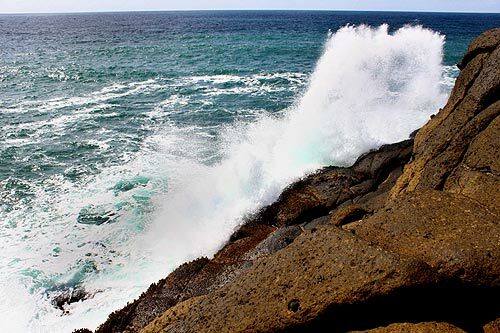 The cliff above this roiling, broiling cauldron of angry ocean somehow curves around a ways, almost enough to meet itself, creating the effect of looking down a giant tube to the Pacific below. There's a bench here for viewing, and you can walk around this edge to some degree. However, be very cautious here as there is no railing and it's easy to slip and tumble away to your demise. In fact, the creator of the TV show COPS, Paul Stojanovich, died here in 2003 in just such a way. Aside from this awe-inspiring sight, there are other equally amazing landmarks that won't be easy to forget. Perhaps even more stunning than the cove view is the towering weirdo basalt structure called Cube Rock, which rises out of the ocean in a rather out-of-context manner. It looks a bit like a massive Roman column ruin, as if built by a mysterious race of ancient giants. If this structure wasn't hidden behind brush and a quarter-mile hike from a parking just north of the Neahkahnie overlooks, it would be more famous than either the Cannon Beach or Pacific City Haystack Rock. Depoe Bay's North Point. At first glance, this rocky, rugged spot of black basalt is spectacular enough as a hidden spot from which to view the ocean. But a lot more happens here than meets the eye. 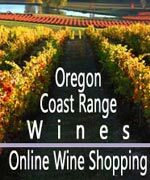 Some of the more immediate highlights include the fact you can walk out on a rocky promontory and seeDepoe Bay from an angle of being out to sea, and the fact that under the right conditions you can feel the waves actually shake the ground just a bit. Look closer, however, and you'll be even more amazed. At its northern tip, as you gaze out at a stunning and new view of a small cove, notice the odd patterns in this former lava flow that look as if a railroad once existed here. Even more interesting is the sort of natural “basement” that happens with a sudden dip in the basalt rock, which even features something akin to a naturally-formed stairway going down. Even more spectacular is the southern edge, with its finger-like outcropping heading out to sea. While it's not safe to go very far out, if you're lucky, whales sometimes linger here, quite close. They're apparently checking you out too, sometimes a mere 20 feet away. This spot is located at the northern edge of Depoe Bay behind a neighborhood found via Sunset Ave.